The name of mineral ascends to the ancient greek word of epidotus is a "increase", "increase". 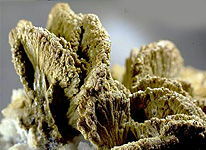 It hints on the feature of structure and growth of crystals of Epidote, at which one side in a section appears more other. 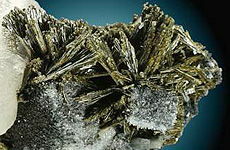 From the chemical point of view Epidote is the difficult on composition water silicate of aluminium, ferrous iron and calcium. Formula: Ca2Fe3*Al20(Si2O7) (SiO4) (HE.) Hardness Mohs: 6,0-7,0. 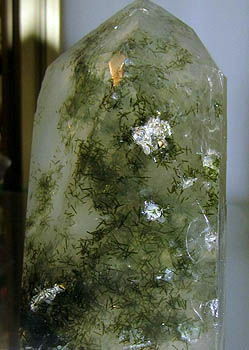 His transparent or semilucent crystals are contained by numerous admixtures. 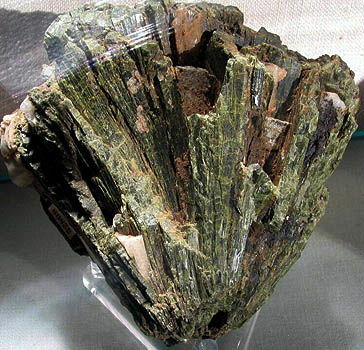 Epidote usually has a pistachio-green blue-brown-green color. Presence or absence brown tints at Epidotes depends on a concentration in them of connections of ferrous iron. There are c.r. and blackly-green stone. Epidote enters in the complement of some jaspers. 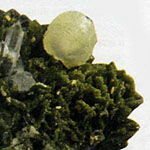 Epidote is observed often as well well-educated prismatic crystals, having strong glass brilliance. The suitable for cutting stone of Epidote of jeweller quality as crystals obtain in Mexico, Mozambique, Norway, USA and Austria. In Russia beautiful transparent Epidotes (пушкиниты) find on Ural in a neighborhood of Ekaterinburg. 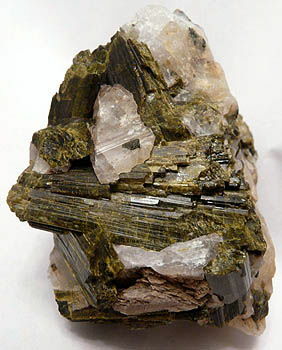 Green and pied Zoisite Rubys rocks (containing in great numbers Epidote) use as decorative and carpentry material, sometimes on ignorance given out for jasper. 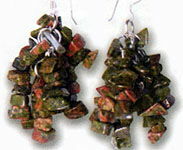 As a trimstone the variety of Zoisite Ruby of rose color is used - tulite, colouring of which is related to the presence of ions of manganese. Rose tulite with a few of other coloured admixtures now and then used and on jeweller business - out of him cabochons make for insertions in rings, brooches et cetera Without the green including of bright-pink, rose tulite outwardly looks like rhodonite (photo down). But began to consider Zoisite Ruby a jeweller stone with 1967, when the beautiful transparent crystals of sapphire-dark blue, violet, greenish-blue color were found in Tanzania (Tanzanite). Treated Tanzanite reminds Sapphire. On the left. Quartz with including of Epidote. Gorbunovo, near Nizh. Tagila, Ural, Russia. On the right. Epidote. Vukhemar, Madagascar. Prismatic pseudotrigonal crystal. Photo: © A.A. Evseev. Coizity are rocks, containing in great numbers Epidote, it is inexpensive semiprecious stone which unoften use in jeweller aims. 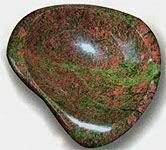 Coizit (Zoisite Ruby Epidotes) of carpentry quality by sight and on hardness remind jasper or varieties of worm-pipe, with which this mineral it is more frequent than all possible to entangle. At price of wares carpentry Epidote and Zoisite Ruby will confront with this group of stone and even can outvalue some from relative rareness. Coizit (Zoisite Ruby) and his varieties have characteristic glass brilliance. A mineral has rich interesting colours at any artificial and natural illumination and looks at oneself far brighter than traditional jaspers. In 1954 in Tanzania were found out beautiful green Zoisite Rubys rocks with including of horny blende and red corundum - aniolite, which are showy decorative material. Transparent green, hazel and colourless crystals are there marked. On the left. Epidote. Stone gold, Severouralsk. Sitting down. Ural, Russia. On the right. Epidote in a quartz. Sitting down. Ural, Russia. Photo: © A.A. Evseev. But began to consider Zoisite Ruby a truly jeweller stone with 1967, when the beautiful transparent crystals of sapphire-dark blue, violet, greenish-blue color were found in Tanzania. This variety of Zoisite Ruby was named by Tanzanite. At lamplight stone acquire an Amethyst-фиолетовый color. The dark blue colouring of new variety is related to the presence of vanadium, and greenish-blue - with the presence of vanadium and chrome. At heating to the temperature of 400-500oC the blue colouring thickens. Tanzanitu is peculiar very strong pleochroism: from dark blue to violet to green (or brown). The crystals of Tanzanite meet in veins in gneisses. Mass the largest from them 122,7 and 220 carats. Treated Tanzanite reminds Sapphire, from which he differs on physical properties (to hardness Mohs 6 - does not scratch glass unlike Sapphire). Green mongolian Epidotes in a silver frame quite good amulet, charm, talisman is traditionally considered from informative noci-influences. 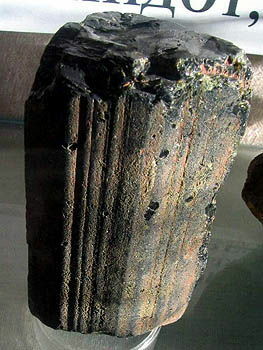 In modern mythology Epidote is considered a stone - " increment", that by a mineral, able to strengthen any positive qualities of the proprietor. Even if you purchased Epidote under the guise of jasper, worm-pipe or rhodonite - it will never harm you and circumferential. It harmonizing and neutral positive mineral.